How to change the motorcycle "Dnepr"
Kiev motorcycle Dnepr is very popular among poorer motorcyclefervently, which used the Japanese very expensive, and the Chinese do not draw any design or quality. In addition, each owner of the Kiev oppozit seek to alter your motorcycle to the best of their abilities. 3. A set of garage keys and locksmith tools. Before you upgrade the bikeand get some experience operating standard variant without a wheelchair. This will help to formulate the program changes the bikeand determine the end result. Sketch accurately calculate their technical ability to the process of tuning is not delayed for years and decades. Disassemble the bike, carefully inspecting all the details and identifying the defective. All components and assemblies thoroughly wash and fold gently. Repair, if necessary, the engine, rear axle and transmission. Upgrades start with the frame. 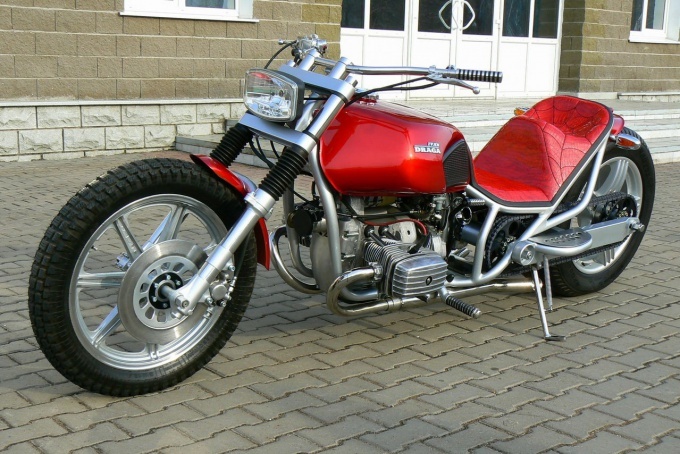 Depending on the desired result, you can lengthen the frame behind the engine on the 50-150 mm with extension propeller shaft, or lengthen the frame in front of the engine (as on a motorcyclee Ural-Wolf). Additionally, you can expand the frame for wider rear wheels with the use of a broken driveshaft or gearbox, to change the angle of the front fork (it should be not more than 33 deg.) and/or change angle of rear shock absorbers to improve the appearance. In the design of the frame you can include small improvements: install Cup for front fork, to reduce the height of the saddle, to raise the frame front. If you think a radical change of frame, it will be easier to cut it completely in pipe, and then to fabricate a new frame from the resulting pipe. Frame Dneprand perfectly amenable to welding, provided the weld quality must be high. If the experience in welding works for small, practice on similar pipes. If you need more pipe, take them off the other frames. Don't use water – they do not have the required strength and have the wrong diameter. For welding use welding semi-automatic, is included in max current. The entire perimeter of each welding seam must be welded in a single pass. Frame cook on the clamps to provide the necessary evenness of the wheels. The discrepancy between the track of the wheels may lead to accidents in the future life. The most beautiful, stylish and unusual tank can be made only manually. In garage conditions is well established a simple fabrication method using fragments and parts fuel tanks produced from motorcycles. So for making teardrop tank are good tanks from motorcycles To-750, IZH-49, Java. Before starting work, clean the old tank outside, removing layers of paint using the grinder with a thin circle. Cut away the rusted sections and replace sheet metal with a thickness of 1 mm. the tank is Then cut according to the selected extension schema (center or sides). Cut the tank clean inside. In the area of the welds, remove the zinc coating that it does not spoil the quality of welding. Advanced tank lock welded threaded studs or rods. Then weld the pads. Welding guide short clamps in different places that the tank has not warped. For sealing tank use specialized sealants or a mixture of epoxy glue with aluminum powder. The sealing composition of the RUB in a clean fat-free weld with a stiff brush. With the filler tank be careful not to damage the sealing layer. If possible, put the bike on the wheel for the final determination of the style of the wings. They can just clip in the chopper style. To completely remove or trim too short is not recommended. Front wing performs its functions even when the minimum size. The rear edge of the rear wing to perform its function should be no closer than the line of the rear wheels. Other design – ultra-deep wings, giving the appearance of a La Indian and perfectly protects from dirt. With lines of lower parts of such wings should not be too low, to avoid damaging them on potholes and curbs. The easiest way to produce wings made of metal, namely of the fragments of the wings of other standard motorcycles. Before operation, clean the workpiece from paint and rust. Produce intermittent weld seam in different places. Ready to edge weld the mild steel wire with a thickness of 5-6 mm. Inside the wing install metal strips for fixing the transaction. The rear wing must be designed and installed so that under no circumstances will not be damaged by contact with the wheel.